When I started writing here in January 2011 this was a personal journal of something new I was trying – running. I just wrote about how far I ran and how hard it was. Then I started writing about other things as well, mostly fun things here in Florida like paddle boarding or festivals and posting the occasional recipe. I’ve gone back and forth between writing quite a bit and not writing at all for long stretches of time, and I’ve tried several ‘writing challenges’ to get me back into the swing of things but I haven’t finished any of them. Why? Because I tend to feel that I should stay ‘on subject’ and write mostly about running. But just like with writing I go through phases of not running at all. I’ve just started running again after several months off, I want to start writing steady again too. But how to get back to writing consistently? This month I am trying something totally different for me. I’m joining Blogher.com’s NaBloPoMo, which is a commitment to write a post every day this month. I’ve tried challenges like this before, but I usually stop writing because I have a hard time tying the writing prompts into anything related to what I usually write about. So this time I’m going to go at it a bit different. I won’t be limiting myself to any subject at all for the entire month. I might write about running and things fun to do in Florida, but I also might try writing a piece of fiction related to nothing at all or I may do a post that is just pictures. Photography is an area I think I’d have fun doing more of. 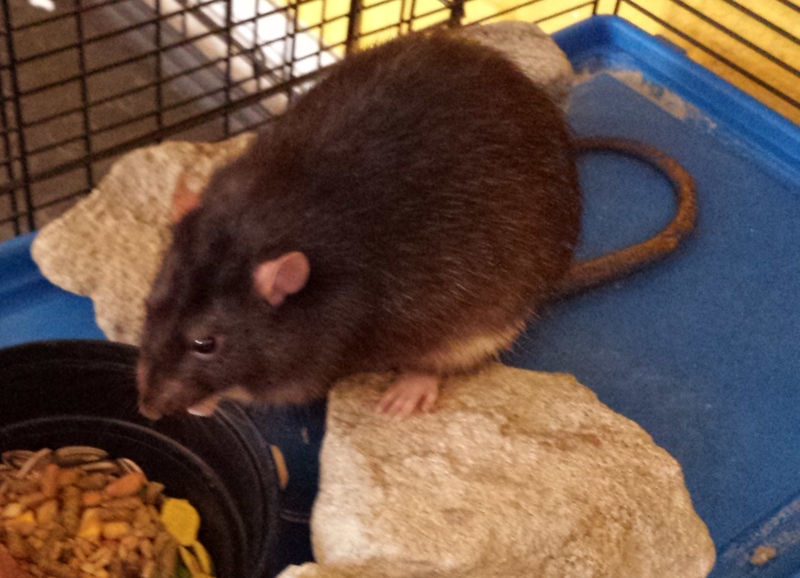 Just to get the randomness officially started, here is a picture of Boots, one of our 3 would-have-been-snake-food rats. How do all people not see how cute and friendly rats are?? Have you ever found you have set limits on yourself that were unnecessary in hindsight? Are you joining NaBloPoMo or another writing challenge? If so what made you decide to join or what are you doing differently than you have before in your writing? This entry was posted in Blogging, Just Zennish and tagged #NaBloPoMo by Kinda Zennish. Bookmark the permalink.